Will I sound uncultured if I admit to enjoying a $1.00 bottle of wine? Today we are off to Fiesole, a hill town that overlooks Florence. We are driving through San Piero a Sieve, as we have done numerous times already and Chris spots a shop he has seen an ad for. We pull off and wander in. Inside the shop is a variety of bottled wines and specialty food items. Along one wall are large stainless steel vats with a spigot at the bottom along with an alcohol content and a price list attached to each vat. 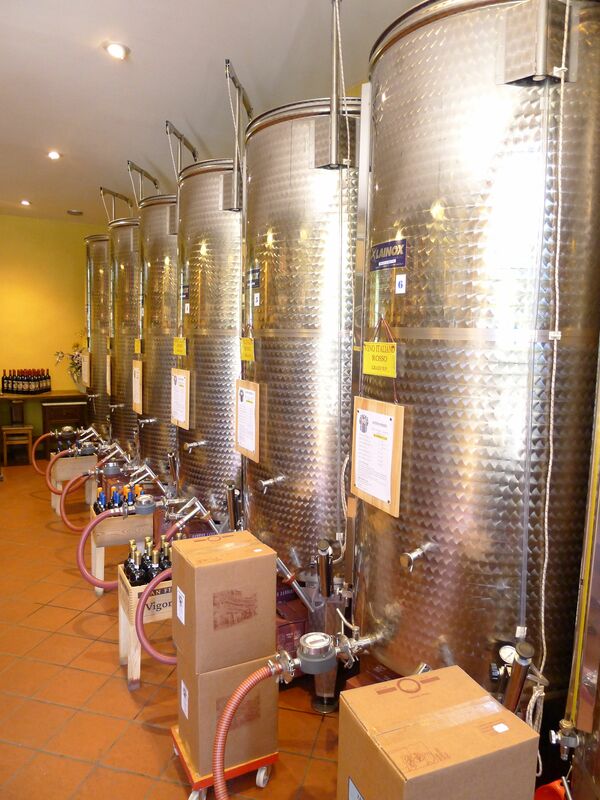 They have graciously filled a number of bottles from each vat, but you can bring in your own bottles and fill them up as well. We choose a bottle of red and a white for one euro each and then splurge on a 2 euro bottle of sparkling. Over the next couple of days we sample these wines and are surprised to find that they are perfectly pleasant and in fact just as good as anything else we have had and in some cases better. So now all I have to do is reconcile the economies of scale with my fancy wine opener and bargain basement wines. 1 Response to Will I sound uncultured if I admit to enjoying a $1.00 bottle of wine? You have obviously now fully settled into relaxed vacation mode.